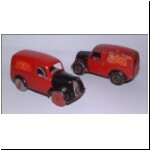 published in four parts in Diecast Collector November 2006 to February 2007 inclusive. (2) CHARBENS cast under roof, COPYRIGHT under bonnet. (3) MADE IN ENGLAND added under roof. 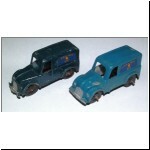 The first type vans do come with diecast hubs and rubber tyres, but most vans had the standard solid metal wheels. 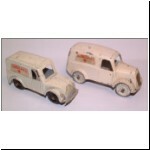 Some of the early vans have white tyres and it has been suggested that they may have been produced pre-war. 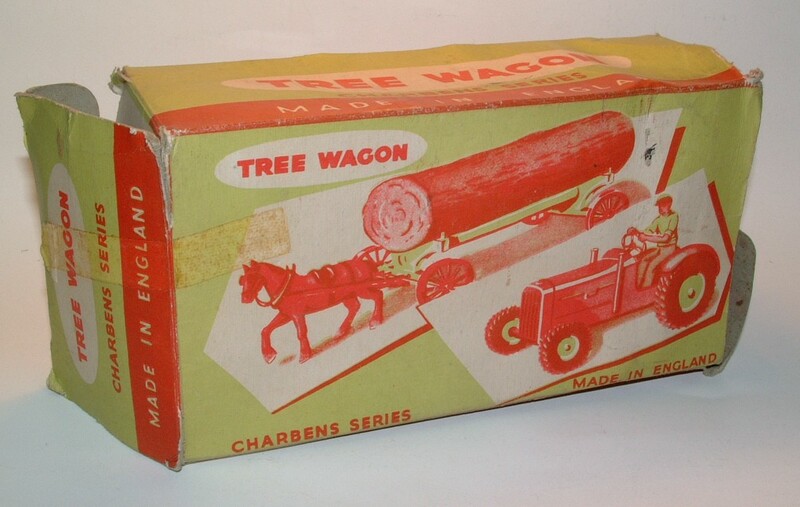 On the other hand, Charbens may just have been using up stocks of pre-war tyres. It would be nice to have some more evidence one way or the other! 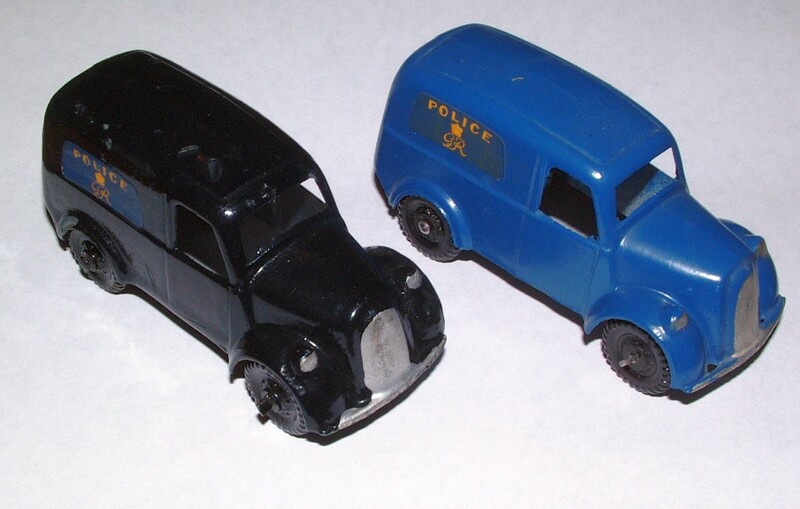 I have also seen one of the second-type vans (Post Office Telephones) with plastic wheels and rubber tyres, as shown earlier on the Tipper Lorry (see part 1). 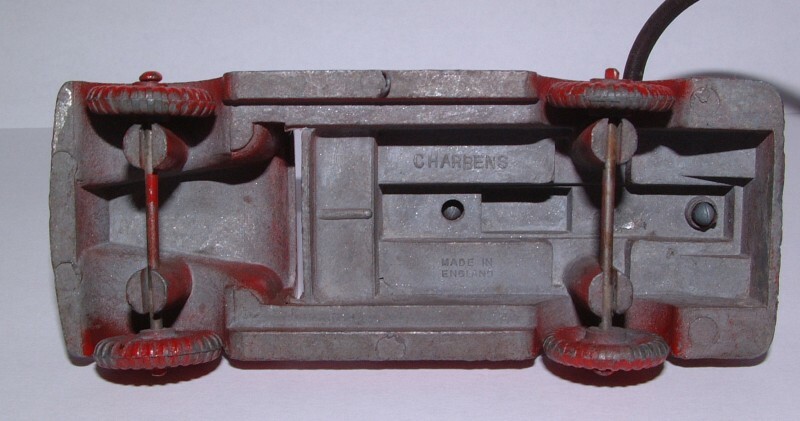 Length 79mm (first casting), 87mm (second casting), late 1940s to 1960, boxed in half dozens. 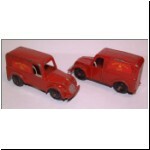 The van with rubber tyres had transfers reading ROYAL MAIL G VI R, replaced by paper labels reading ROYAL MAIL GR (without the roman number six) on the version with solid wheels. These labels continued to be used on the second type casting, even long after the accession of Queen Elizabeth! 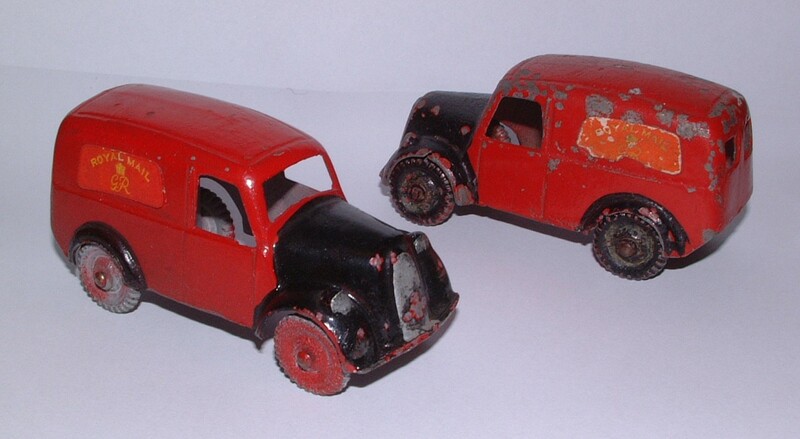 Body colour was red, with the addition of a hand painted black bonnet and rear mudguards on the second casting. 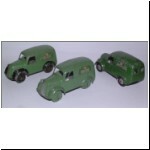 Length 79mm (first casting), 87mm (second casting), late 1940s to 1962, boxed in half dozens. 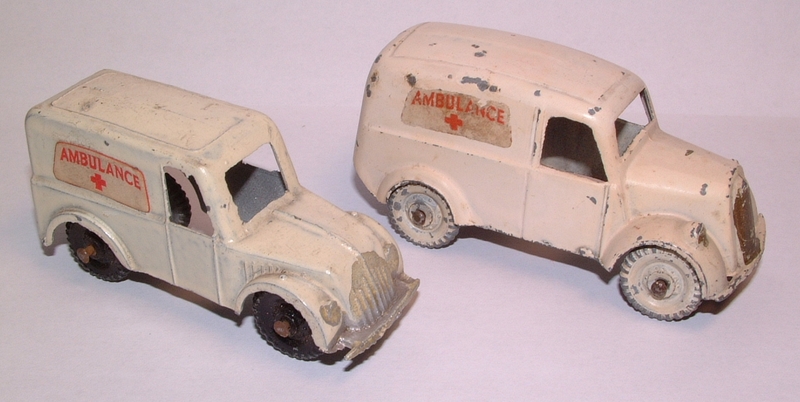 AMBULANCE and a red cross on paper labels. Colour: Off-white. The second casting version pictured has gold trim. 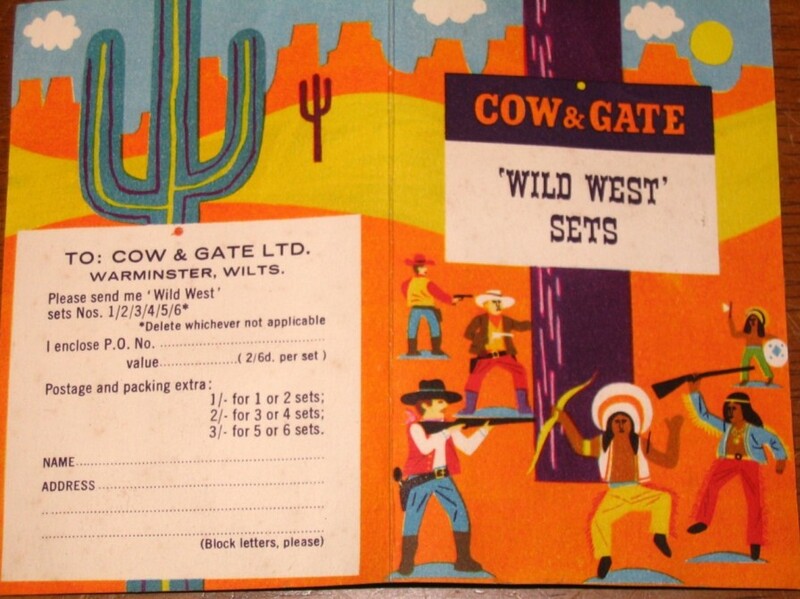 CARTER PATERSON paper labels. Always dark green. Probably the most common of the vans. 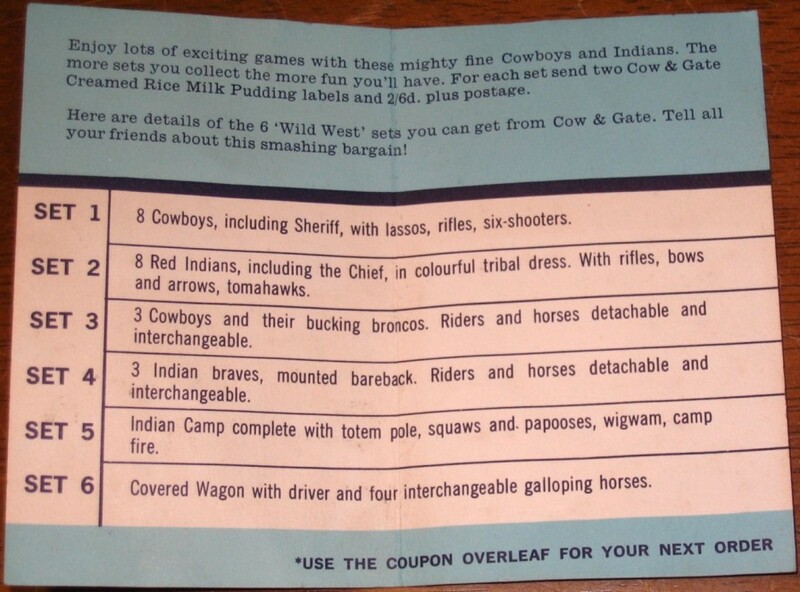 POLICE GR paper labels. 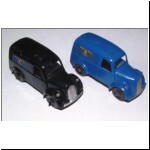 Colours: dark blue or very dark blue (almost black on some models) on the first casting; on the second casting, earlier models were black, followed by a somewhat lighter dark blue. 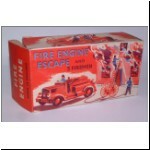 Length 87mm (second casting only), late 1940s to 1962, boxed in half dozens. 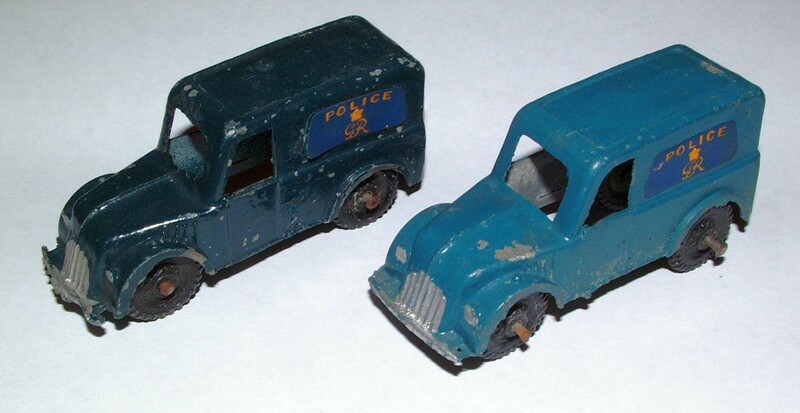 This model was always listed as slightly more expensive than the other vans, and I wonder if it came with a ladder, similar to the Dinky Toy telephones van? 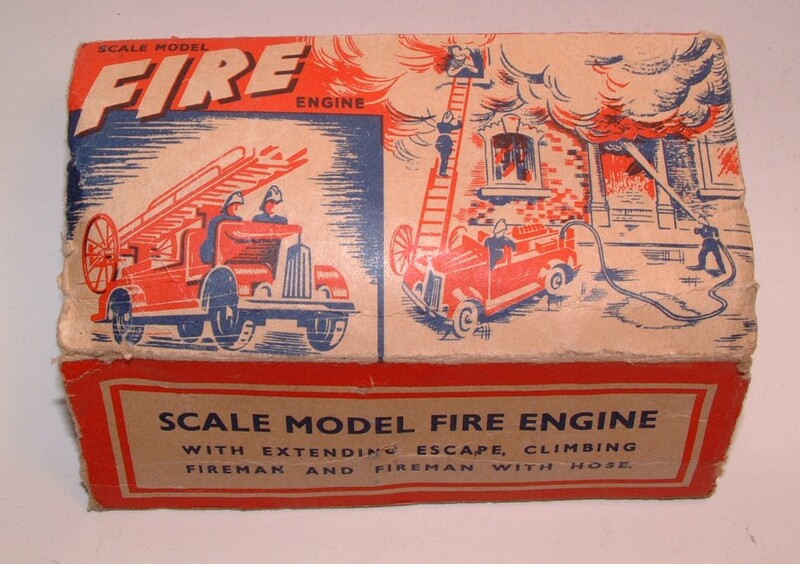 I have never seen a trade box of these models, which might prove the point. POST OFFICE TELEPHONES paper labels. 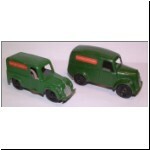 Colours: light green with or without black mudguards, metal wheels; or green (without black trim), metal wheels or grey plastic wheel hubs and rubber tyres. 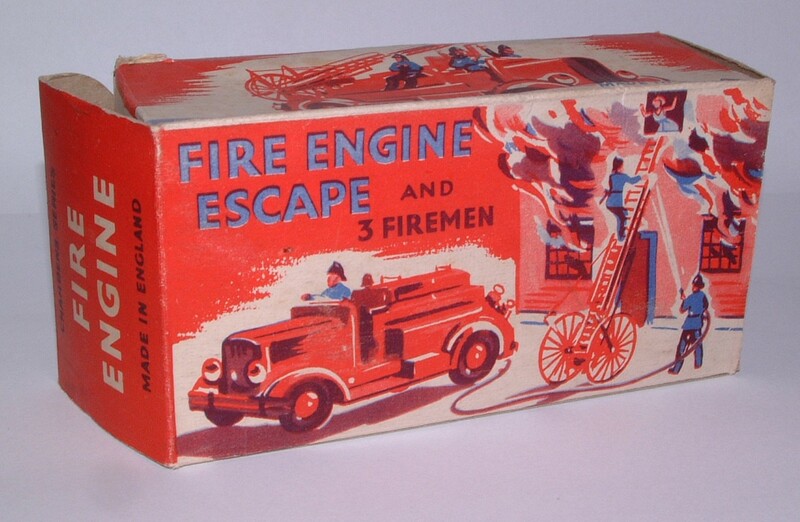 Length 99mm (excluding ladder), late 1940s to 1962, individually boxed. 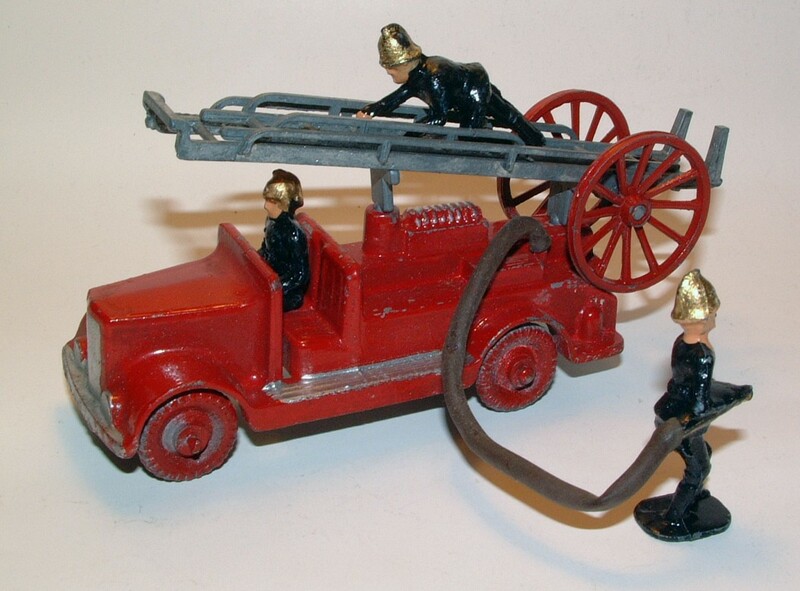 This is a rather nice piece for display, having a rubber or plastic hose and three diecast firemen, one driving, one holding the hose nozzle and the third climbing the ladder. 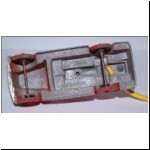 The basic casting is very common, but the fragile escape ladder is easily broken (particularly when there is a degree of metal fatigue) and complete examples are much harder to find. The die was substantially re-cut or possibly re-made with a new core between versions (1) and (2) below. 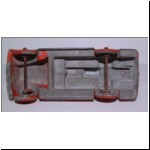 The later version is a thinner and lighter casting. There are also several minor casting variations which I will not go into here, instead I can summarise the three major variations as follows. 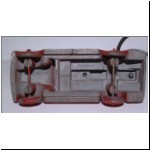 All variants had two unpainted ladder supports which plugged into the body casting. 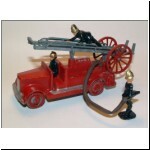 (1) Dark red body with metal wheels, black firemen, unpainted escape ladder with dark red wheels, rubber hose, CHARBENS MADE IN ENGLAND cast underneath. Thick sides to the body casting when viewed from underneath. 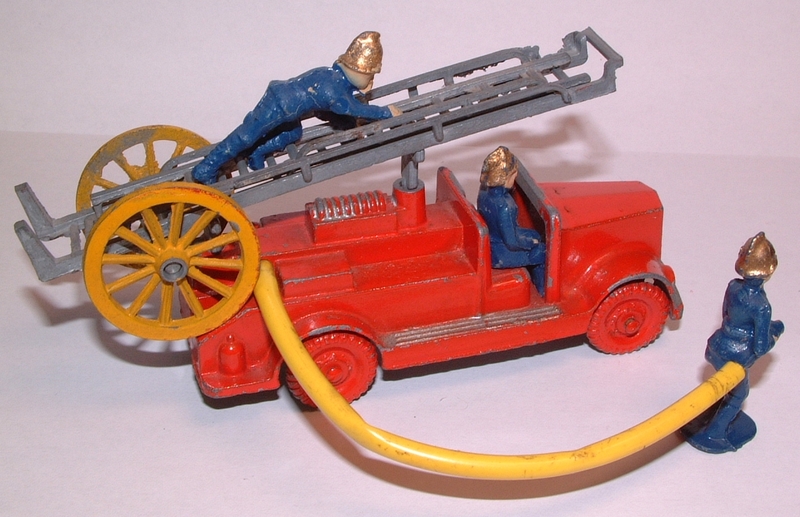 (2) Red body (shades vary to a bright tomato red) with metal wheels, black or dark blue firemen, unpainted escape ladder with yellow wheels, plastic hose, with MADE IN ENGLAND (very faintly) or MADE IN ENGLAND CHARBENS cast underneath (location of the lettering varied). 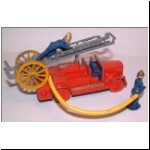 Some examples of this version had a hole so that hose could emerge horizontally from the pumper rather than vertically (as in the photo). 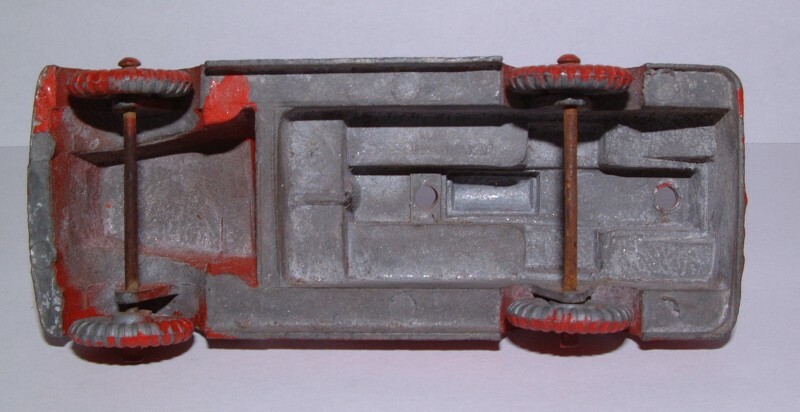 Lighter casting with thinner sides when viewed from underneath. 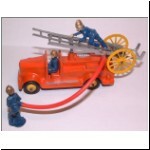 (3) Orange body with yellow plastic hubs, rubber tyres, dark blue firemen, unpainted escape ladder of a new design (without hand rails), yellow ladder wheels, plastic hose, MADE IN ENGLAND CHARBENS cast underneath. 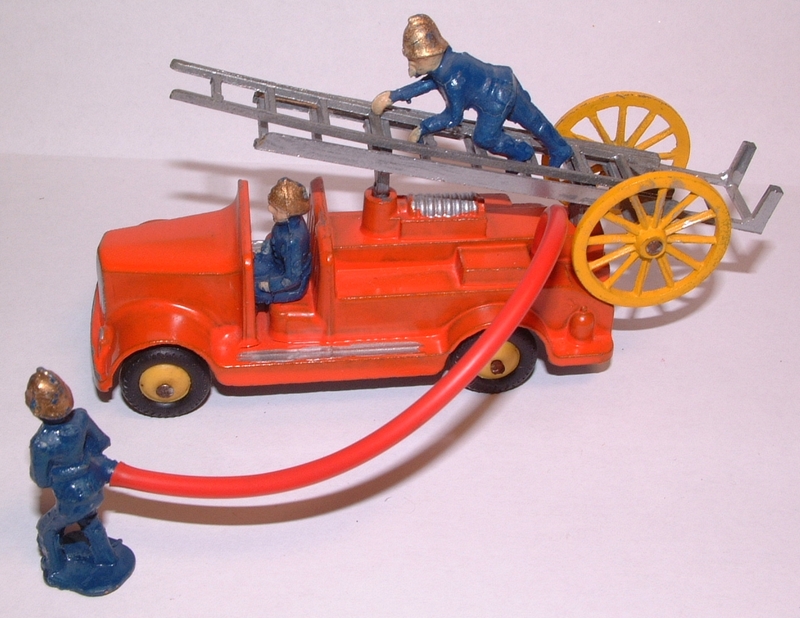 The inner section of this ladder was the same as the outer ladder supplied with no.40. 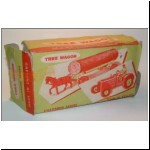 Length 215mm (metal horses) or 202mm (plastic horses), late 1940s to 1967, individually boxed. 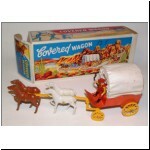 Several manufacturers made Wild West covered wagons, but the Charbens wagon is quite easy to recognise with its long footboard and deep sides to the wagon. 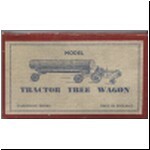 However the first version did not use this casting of the wagon, but was an adaption of no.7 Delivery Van (see the first photo above). 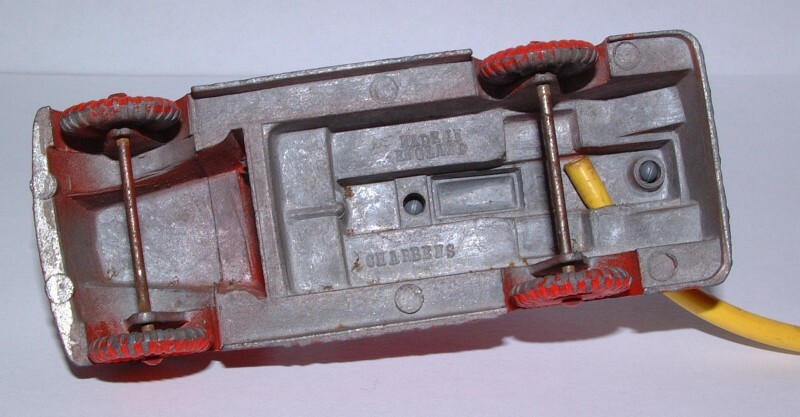 The lower half of the van casting was modified with different rear axle supports (possibly by using an interchangeable insert in the die) so that large spoked wheels could be fitted on the rear axle, and the model had a new turntable and pole to which the front wheels and horses were attached. 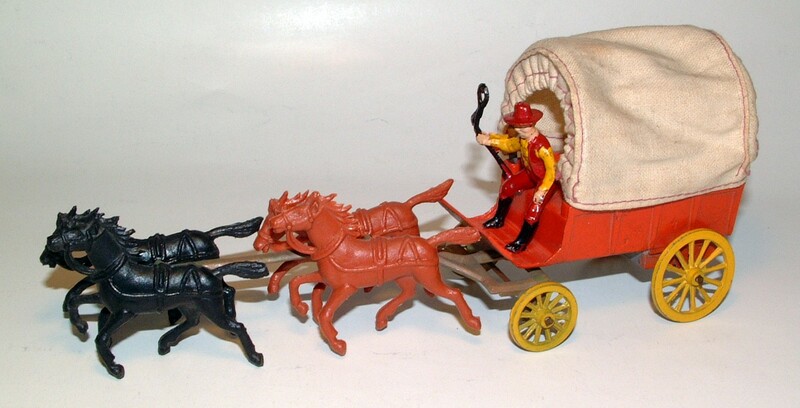 Along each side of the wagon, an unpainted metal casting was provided with slots at each end to take the diecast canopy supports. 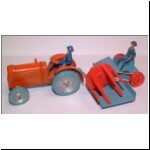 The diecast horses were the same as for no.25 Milk Cart but with square holes cast through them. 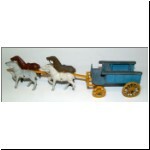 Light blue wagon with CHARBENS MADE IN ENGLAND cast underneath, yellow wheels and pole, horses brown (shades vary) or white. 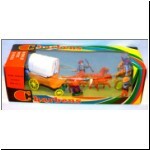 (1) Green or orange wagon, yellow diecast metal shaft and wheels, brown or white diecast horses, cloth canopy with diecast hoops, CHARBENS MADE IN ENGLAND cast underneath. Hollow-cast lead driver with whip. 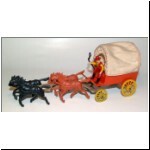 (2) Orange wagon, brown plastic shafts with white, black or tan plastic horses, yellow metal wheels, cloth canopy with metal hoops, no identification cast. 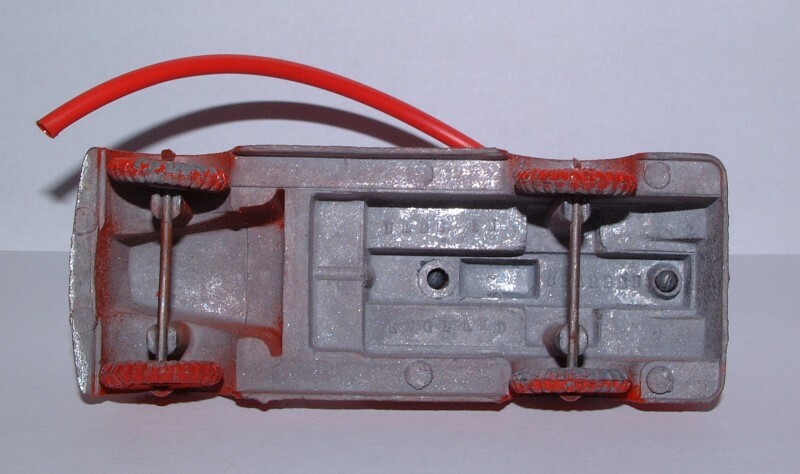 Hollow-cast lead or light blue plastic driver with whip. It is notable that the metal horses were zinc diecast, and therefore less realistic than Charbens' traditional lead hollow castings, because the belly of the horse was not fully formed. The horse's legs were also flat on the inside face! This drawback was corrected on the plastic horses, which of course were solid mouldings and therefore fully three-dimensional. 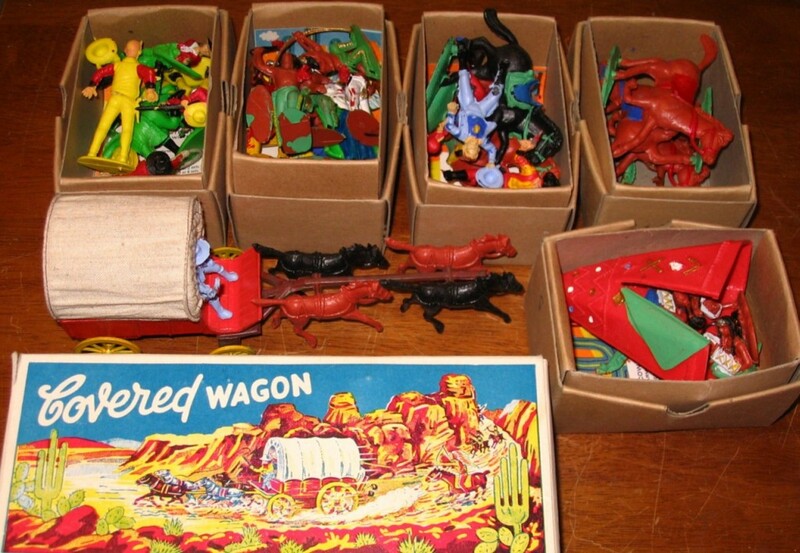 The plastic horses have been reissued by Plastics from the Past*. 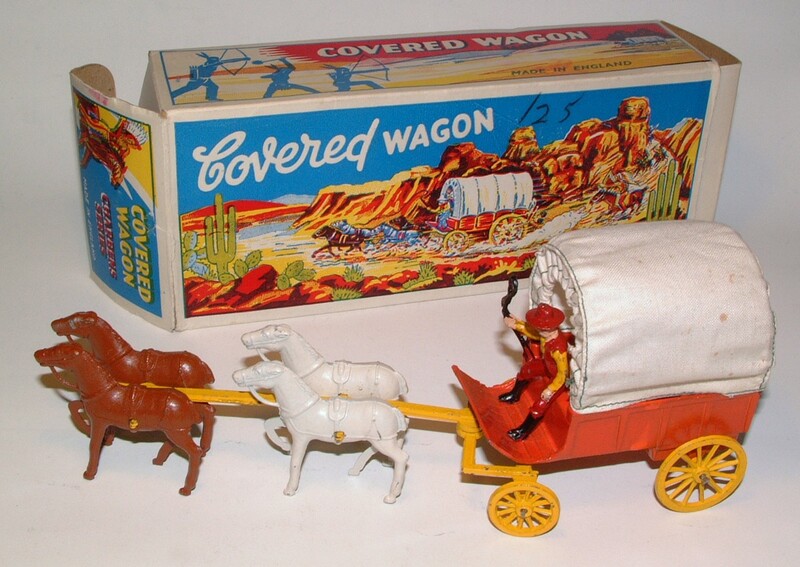 There was also an all-plastic version, including a plastic canopy, issued with plastic figures in a window box as No.99 Covered Wagon Set. 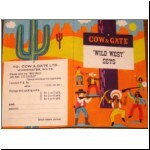 A promotion by Cow & Gate Ltd. offered six different Charbens 'Wild West Sets' for 2s6d each plus labels from Cow & Gate Creamed Rice Milk Pudding. 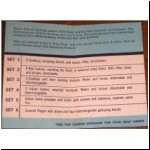 Details of the sets are shown in the leaflet pictured. 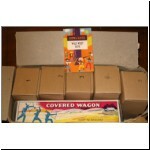 The Covered Wagon was set no.6. 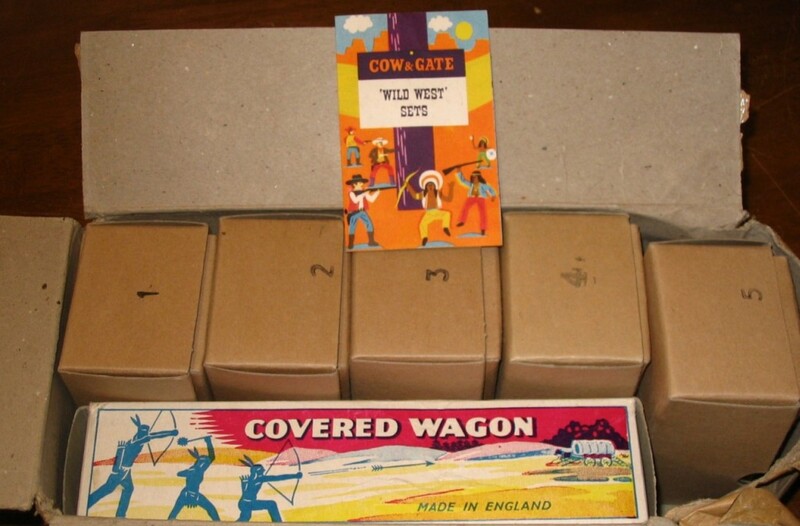 Length 283mm, about 1950 to 1967, individually boxed. 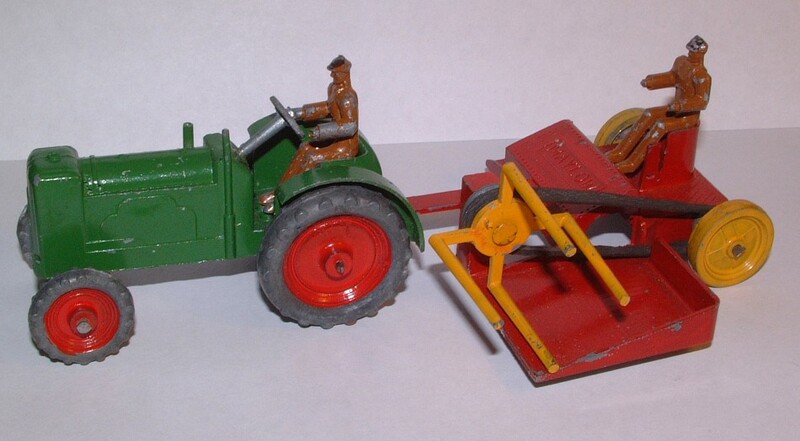 Tractor and driver as no.6. 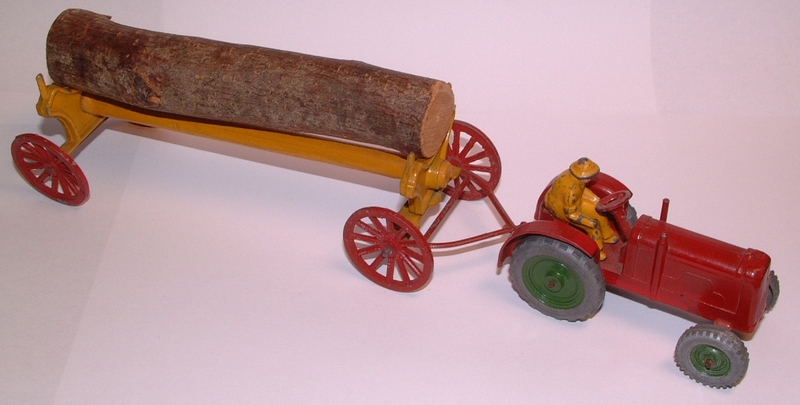 The log trailer was the same as no.1 but with a drawbar in place of the shafts. Both versions of the trailer were issued, i.e. 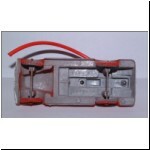 with a square section diecasting or a wood dowel as the main chassis member. 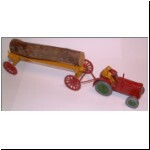 Colours: yellow trailer with red wheels and drawbar. 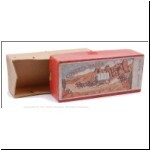 Length 149mm, about 1950 to 1962, individually boxed. 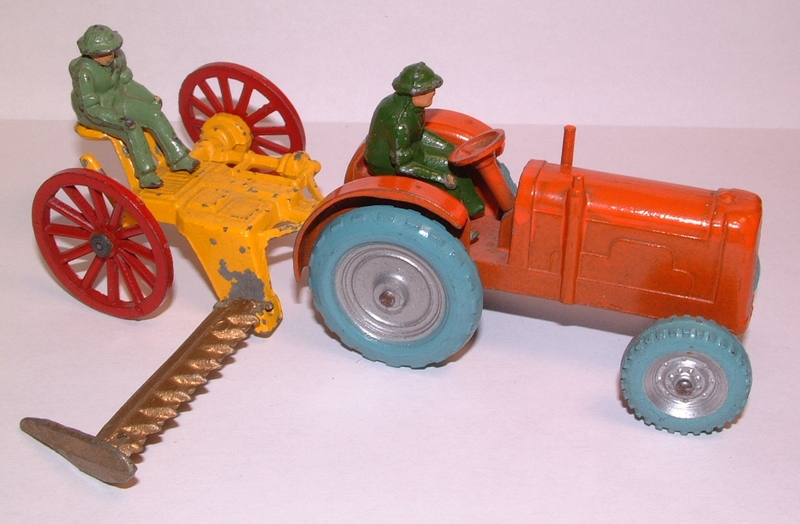 Tractor and drivers as no.6. Grass cutter as no.3 without the shafts, CHARBENS MADE IN ENGLAND cast underneath. 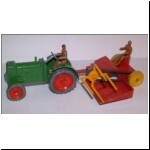 Colours: yellow trailer with red wheels, unpainted or metallic gold cutter blade. 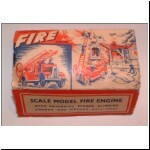 Length 174mm, about 1950 to 1967, individually boxed. (1) Green body, yellow metal sails, red wheels, with or without CHARBENS MADE IN ENGLAND cast underneath. 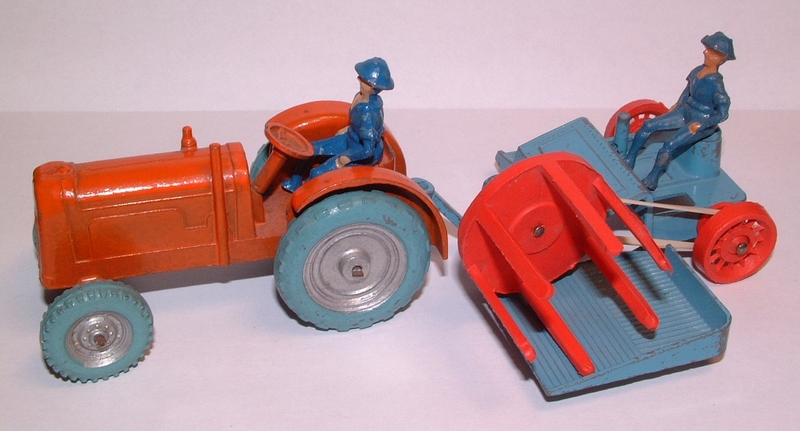 (2) Light blue body, red plastic sails and wheels, CHARBENS MADE IN ENGLAND cast underneath. 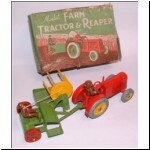 (3) Brown plastic body, yellow plastic sails and wheels. 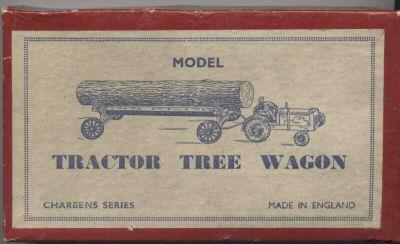 The reaper set seems to be the most common of the three tractor/trailer sets. 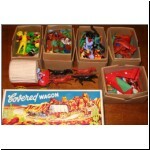 The plastic version is rare and can be seen in the "Panorama" gift set illustrated in Part 1. 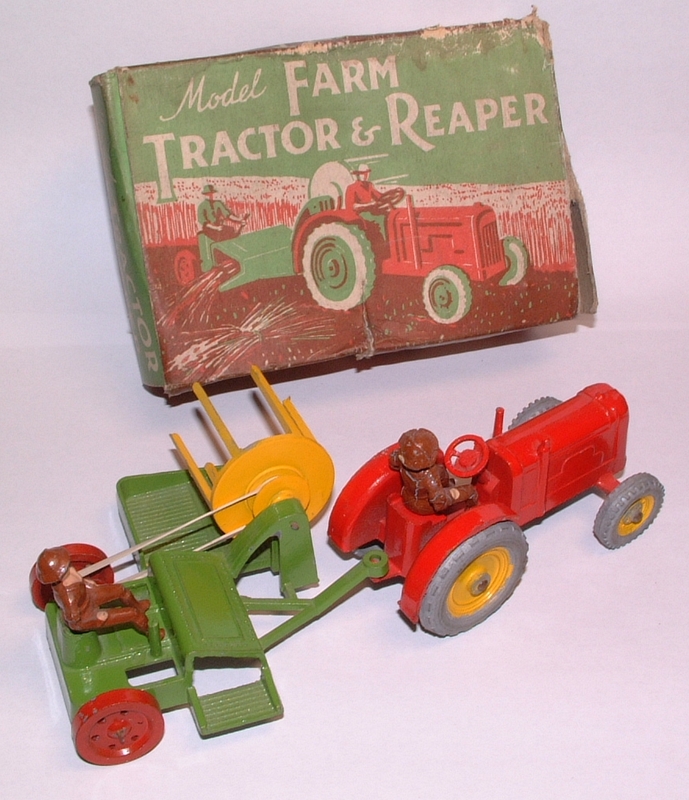 Also pictured is a copy of the tractor and reaper made by Maylow. Both pieces are marked with the maker's name, but I have not been able to find out anything else about this manufacturer. The Maylow copy is much more scarce than the Charbens. Hollow Cast Civilian Toy Figures by Norman Joplin and Philip Dean, Schiffer Publishing Ltd., 2005. 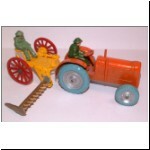 Plastics from the Past have reissued some plastic Charbens items from original moulds. 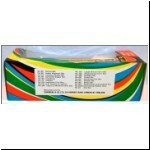 See www.plasticsfromthepast.piczo.com. Photos by Michel Sordet are taken from Les Jouets Anglais au 1/43 (CD-ROM), published by MaCollection, www.macosordet.com.